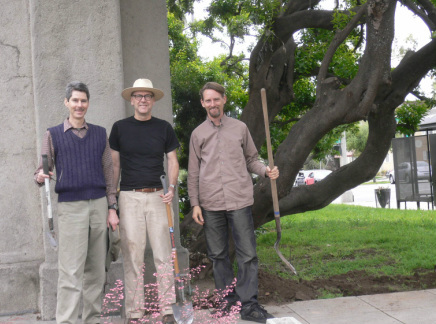 Volunteers from NELA Transition and Throop Unitarian-Universalist Church worked together on Saturday, April 23, 2011 to lay the groundwork for a Learning Garden on the church’s site in Pasadena. Their efforts were the result of a decision by both organizations to pursue a partnership to create a community space to bring people together to share skills that can make our community more resilient. More than 15 volunteers from both organizations got acquainted with each other and participated in efforts to prepare a series of vegetable planting beds along the south edge of the church sanctuary on Del Mar Avenue. The work included the removal of old stumps, weeding, and the enrichment of the soil with compost and top mulch. Later in the week, volunteers planted the area with tomatoes, squash, beans, and peppers, as well as attractive marigold flowers that will serve to discourage some pests. The planting of a seasonal vegetable garden is just the first step in a planning process between the two organizations. Informal discussions of the project have included proposals for the conversion of the church’s lawns to raised planting beds through sheet composting, the storage of rainwater to lower water bills for landscaping and meet Pasadena’s storm water management goals, and an increase in the number of drought-tolerant and native species on the site. NELA Transition promotes the establishment of communities that will be resilient in the face of limited future resources in the post-petroleum era. These goals can be met partly through the conversion of lawns to landscapes that feed both people and wildlife, but just as important is the reestablishment of neighborhoods where people know and cooperate with one another. A learning garden would be a place where neighborhood residents re-connect with each other and teach each other sustainable landscaping skills. Throop Church was established in 1897 by a group of Pasadena community leaders headed by Amos Throop, one of the founders of Cal Tech University. The church moved to its present site in 1923, erecting an imposing structure that combined a neo-gothic sanctuary with a Craftsman community hall.